How can you be certain any trend is relevant for your business if you don't know THE WHY behind? Would you like to not only visually grasp a trend but actually understands its origin? This digital trend book has been crafted during our bi-anual Trend Think Tank with the help of experts from different creative areas to set one general direction we call the ONE BIG IDEA. 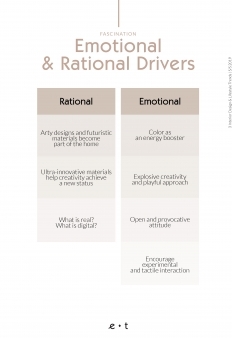 a large percentage of end consumers today who relate to any of these three trends. 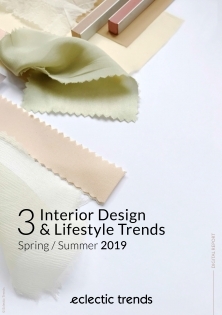 As a result of their needs and values, three Key Trends stand out which are represented through visuals, material, pattern and shape definitions, drivers and color palettes that will help you to take design and communication decisions. 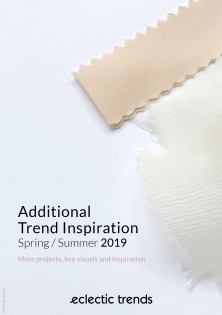 The digital trend book includes three key trends for Spring/Summer 2019. 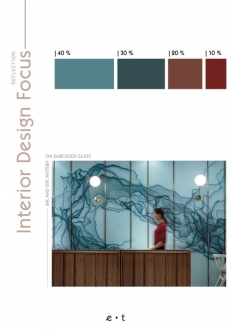 Each theme is supported by clear product direction pages containing original imagery divided in Lifestyle Inspiration and Interior Design Focus references. All trends are linked under an umbrella theme or ONE BIG IDEA which describes social, cultural and consumer trends that allow you to understand how these trends were born and can be translated. 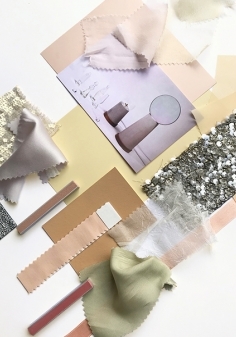 Each trend comes with a palette of 10 colors including Pantone and NCS color codes. In addition, we suggest 4-5 possible color combinations within that range to apply. We will share a few insights with you when it comes to understand Consumer Expectations of each theme and give you tips of how to Translate Design Features. 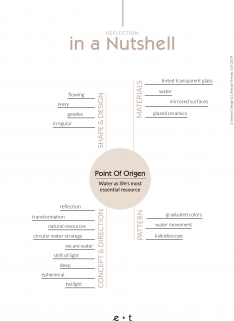 This Trend Report is thought as an inspiration and functional tool. We challenge you to take notes on our Key Takeaways exercises after each chapter and step right into action with your team. 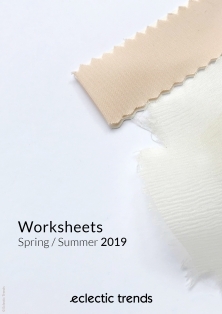 The Digital Report comes with a Triple Bonus of Worksheets, Additional Trend Inspiration and the Milan Design Week 2018 Round-Up. "Our awareness of and action on circular economy and the waste we produce is steadily increasing. 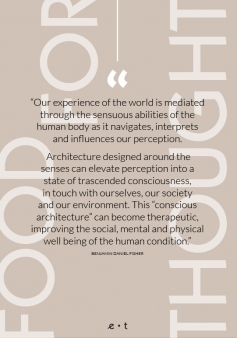 Slow Living became Conscious Living, we are now entering into the era of Upgraded Consciousness, which can not, even remotely, be compared to a trend but a life philosophy. 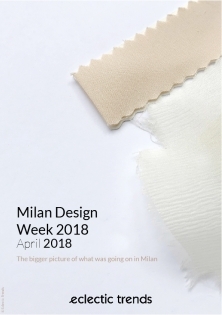 NEW: We are currently working on a Milan Design Week 2018 Round-Up which will be uploaded soon. I have been following Gudy’s work for years now. And while she provides a tone of amazing free content, the trend reports take the applicability to a whole new level. The trend report makes everything much more applicable and the work books that follow along help you internalize the concepts. The completed work books can basically be a creative direction to hand over to a designer or a starting point for your own process. The individual session after accessing to theTrend Report with Gudy where she walked me through the trends in a context of my brand made a world of difference for my understanding of how to translate and practically apply the trends to my product development, or refreshment of some classics. I have also understood much better the social dynamics behind the trends and their importance in communication. It’s not only about the colors or shapes, but in a high degree about the shared values. Basically before I was knowledgeable about the trend, the color pallete but not being able to pull out the elements on my own. I feel that the trend report is like a complex puzzle that is put together for you when you get it. Then your job is actually to break it in small pieces and pick up only few and make your own puzzle. Gudy has zoomed on few small puzzles making it so easy to apply and work with now.